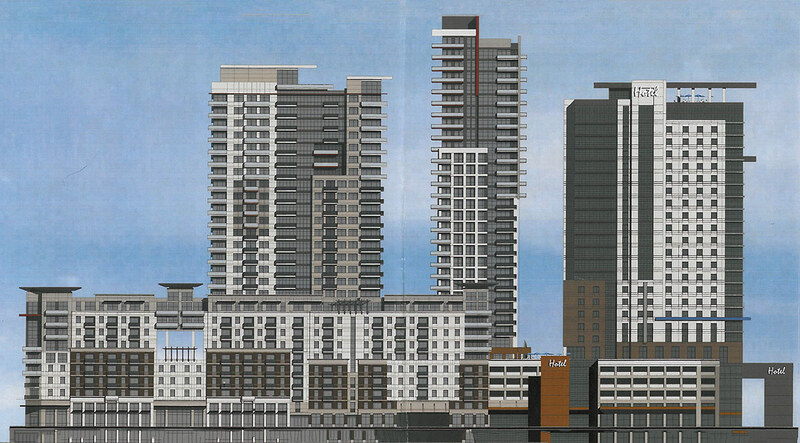 Jefferson Development Group's proposal for three towers in Irish Hill should move forward. 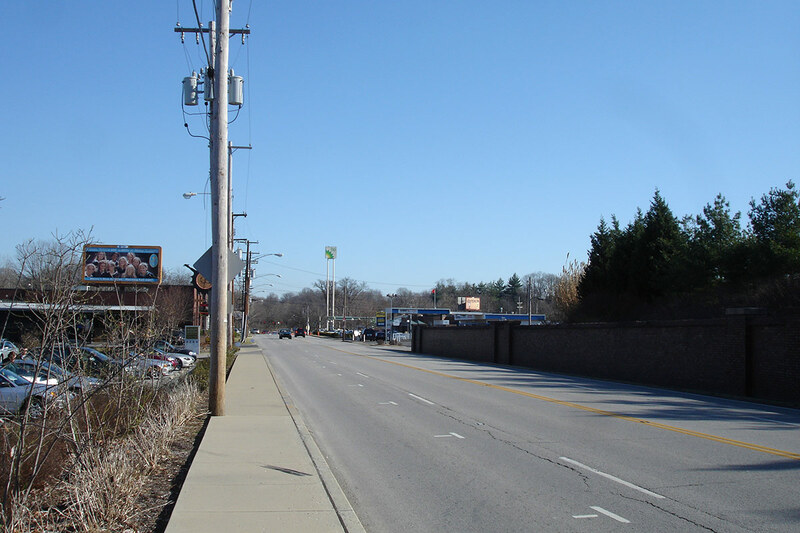 Three towers have been proposed to rise in a woebegone patch of asphalt scattered with several local businesses where three Louisville neighborhoods meet. Jefferson Development Group (JDG), headed by developer Kevin Cogan, is planning apartments, condos, office space, retail, a hotel, and parking on a triangular block bound by Lexington Road, Grinstead Drive, and tiny Etley Avenue. Yet while the proposal is certainly bold and dramatic, a series of public meetings and a proposed development moratorium show there’s some serious opposition to the enormous project. I’ve been thinking about the mixed-use project for a while now—it was first announced in 2014. It doesn’t have a name at this point, but we’ll call it Lexington Grande here in keeping with the nomenclature of JDG’s nearby projects. At first I had a few mixed feelings about the development. I appreciated the density and mix of uses just a few miles from Downtown, especially in this central yet out-of-the-way location, but was concerned about so much planned parking (2,300 spaces!). I admired the attention to the street level and sidewalk design but wondered if the overall design would compliment the natural settings that surround it such as Cherokee Park, Cave Hill Cemetery, and the Beargrass Creek Greenway. The more I thought about Lexington Grande, the more I realized it is completely necessary and especially appropriate at this particular site. But I would urge JDG and their architects, Louisville-based Tucker Booker Donhoff + Partners (TBD+) to take a closer look at a few details that would help the new building integrate with its surroundings and become a cherished landmark and gateway for the city. At first glance, Lexington Grande’s three towers—some of the city’s tallest—rising from a large podium base are shocking in their ambition and scale. 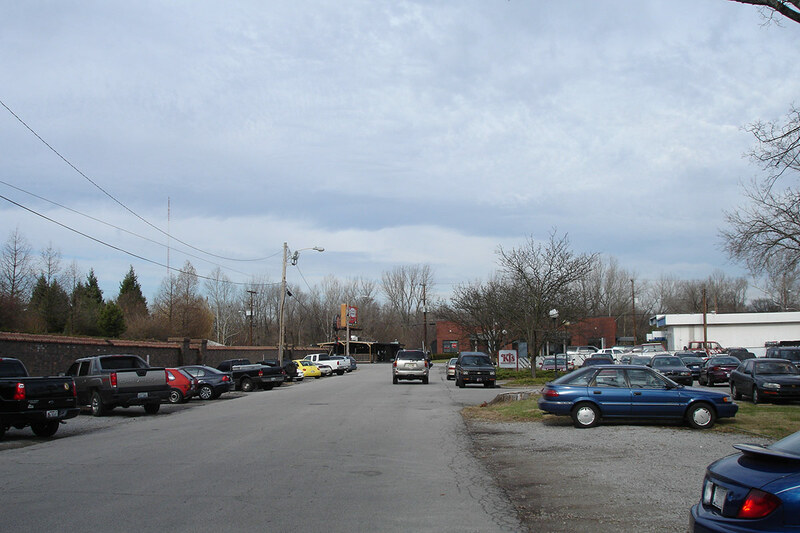 But once the initial jolt of something new on what’s traditionally been a hodgepodge of low buildings and parking lots in a disconnected, leftover corner of Irish Hill wears off, the underlying premise of the project is clearly the right direction for this location and for the city of Louisville. That doesn’t mean I’d rubber stamp the proposal—and I hope serious scrutiny is given to the project as it (eventually) moves through the regulatory process, ending with approval from Metro Council. The 3.3-acre block is currently zoned C-2, which permits the developer to build eight-stories as-of-right, but JDG, through its lawyer, Bill Bardenwerper, is seeking a zoning change to Planned Development District (PDD) that would allow the decidedly taller proposal. The general program of the project is impressive. Lexington Grande would begin at the sidewalk with new pedestrian amenities and 50,000-square feet of retail. The developer has already pledged to keep several local businesses currently on the block, including a steakhouse, bike shop, and dry cleaners, and potentially include a small grocery store. Above, concealing the parking garage podium, are 730 apartments along a single-loaded corridor. This treatment would be similar to a Courtyard by Marriott, which wraps a parking garage at the corner of Second and Main streets. JDG’s garage would contain a whopping 2,300 parking spaces serving the entire project. The apartments would rise up above the garage to define a park-like plaza on its roof, potentially with more retail space. From this plaza, three towers—two for condos and one for a hotel—would climb to heights of 34, 29, and 28 stories respectively. The hotel would contain 240 rooms situated above 120,000-square-feet of office space. JDG has estimated the total project cost at more than $200 million. If Lexington Grande were proposed for the middle of Irish Hill, or neighboring Cherokee Triangle or Crescent Hill, it would be easy to oppose its current scale. But it’s not in the center of a neighborhood—it’s isolated from the historic centers and surrounded by green space. Irish Hill, somewhat appropriately shaped like a shillelagh, a traditional Irish walking stick and war club, lies predominantly to the west of the project site between Lexington and Baxter Avenue on the other side of the cemetery. The building site is isolated by a narrow and spindly corridor of Lexington Road pressed between the cemetery walls, Beargrass Creek and Interstate 64. Still, this snippet of land remains within the neighborhood bounds. Similarly, Cherokee Triangle and Crescent Hill are far from the site but have spurs that reach out and border the site. 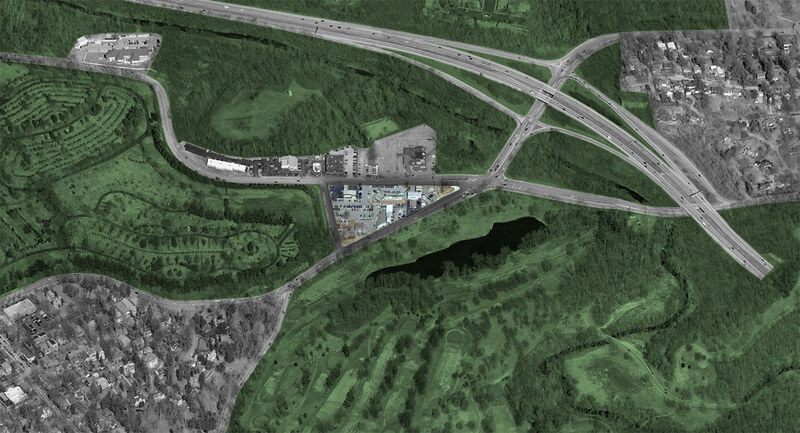 As it would stand, the project borders green space on most of its perimeter with some commercial space to its north. To the south, an underutilized corner of Cherokee Park containing Willow Pond is cut off from the rest of the park by a golf course and is empty most days. An influx of new people could help bring activity to the space and warrant investment in a shoddy pedestrian environment. West, Cave Hill Cemetery sits cloistered behind its brick wall, and east, a vegetated area shields Interstate 64 from view. To the north sits the entrance to the Beargrass Creek Greenway and a planned landscaped CSO basin by MSD that will serve as another sort of park. Density is best placed around such central-yet-depopulated areas and great around parks and active transportation facilities like trails and bike lanes. 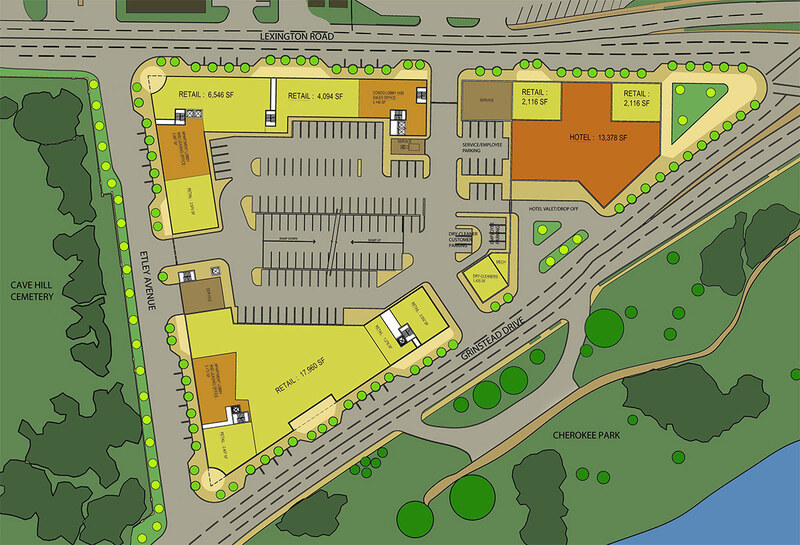 Given Louisville’s automobile-oriented transportation setup, it would seem likely most people living, working, or shopping at Lexington Pointe would have a car in tow. And for them, the site is conveniently located at the intersection of two prominent streets and a short distance from the Grinstead Drive entrance to Interstate 64. But there are plentiful transportation options that don’t require a personal vehicle at this site as well. The Beargrass Creek Trail is an excellent bikeway and is planned for extension to the Ohio River. 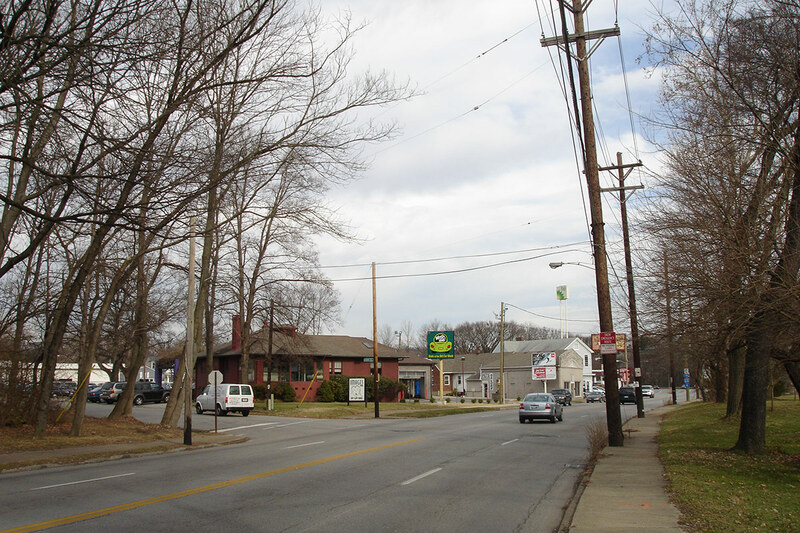 Grinstead has been striped with bike lanes for several years now in both directions and plenty of low traffic residential streets make for pleasant biking to Frankfort Avenue or Bardstown Road. TARC also operates two bus lines passing by the site (Routes 25 and 29) and a half-dozen express routes pass by on 64 without stopping. It seems logical that TARC could adjust its routes given such an increase in activity and density. Moreover, the mixed-use nature of the project means overall transportation demand may be reduced. 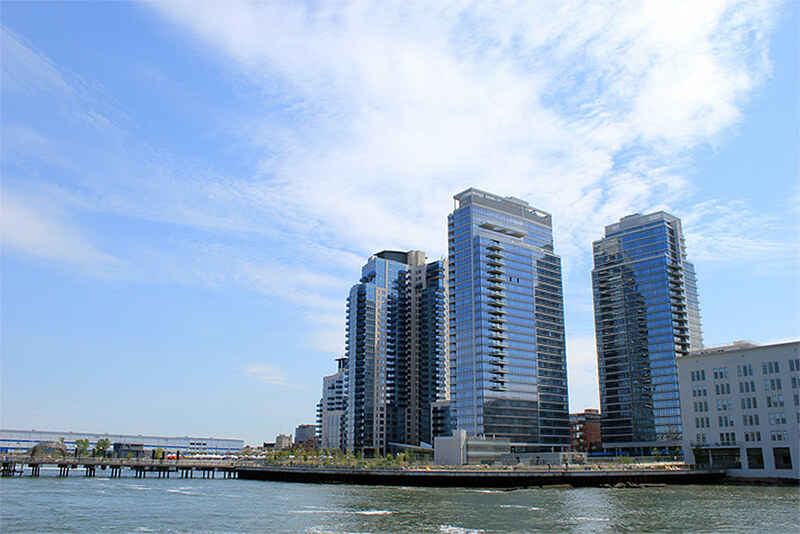 For instance, someone staying at the hotel may be doing business in the office space, or perhaps a person living in the apartments works in the retail or office space in the complex. 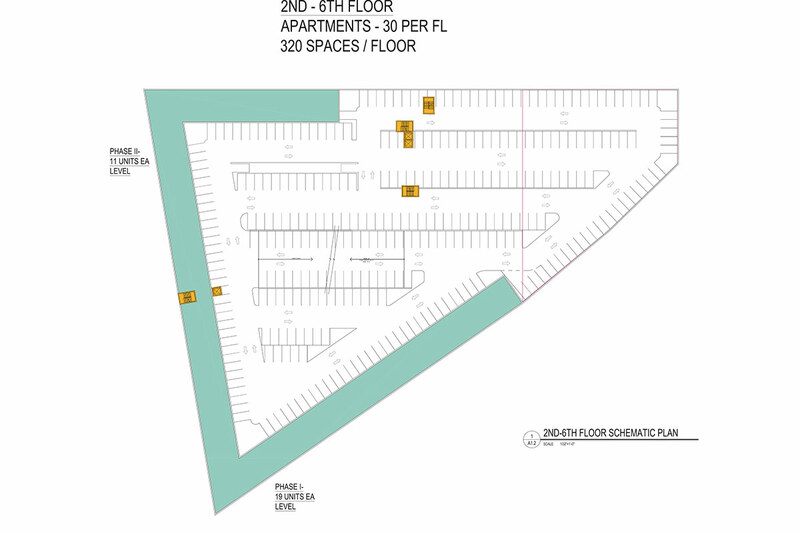 One of the downsides of the proposal, in my opinion, is the behemoth quantity of parking spaces in its garage: 2,300 spaces. That’s a lot of parking, but at least it’s predominantly hidden behind hundreds of apartments. Still, the existence of parking works as an incentive to drive and the cost of building a structured garage increases the cost of the development and ultimately the cost of apartments, condos, and commercial space. Some residents of Irish Hill and surrounding neighborhoods have expressed concern over the project, however. The main concerns are of the typical NIMBY variety—namely that the project would create parking problems and increase traffic. Bardenwerper said a consultant is studying traffic in the area and proposed a stoplight at Etley Avenue, which would have the dual effect of making Grinstead easier to cross on foot. In terms of traffic, there’s already a plan—the Lexington Road Corridor Transportation Plan—that’s nearly two years old yet remains unimplemented in typical Louisville fashion. That document calls for a protected bike lane, improved sidewalks, and reconfigured roadbed for the area. Traffic counts compiled by KYTC for this stretch of Lexington show the street already handles less traffic than a similar road diet treatment on Brownsboro Road several years ago. It’s time this plan were implemented. TBD+’s design doesn’t break any barriers, which is a good and bad thing. To my eye, the generally generic design could fit in a number of cities, but that’s something of the reality of such architecture today (more on that in an upcoming article). At first glance, the trio of towers made me think of another large-scale mixed-use project in my old neighborhood of Williamsburg, Brooklyn. Above is a photo of The Edge on the East Riverfront. JDG’s structure, which appears to be clad predominantly in stone or precast, brick, glass, and metal panels, has some handsome angles, especially from the sidewalk level near the apartments. But it ultimately comes off as somehow too generic and cold for the leafy setting surrounding it. The facade wall, while broken up visually with different materials, currently runs a high risk of appearing flat in real life. Setbacks, while they may add cost, would greatly enhance the project’s design and provide larger outdoor spaces for some apartments. Moving east toward the office component, the design takes a distinctly more commercial tone with a glass facade. That’s unfortunate as offices don’t need to look corporate, especially next to so much park and green space. Here at the prow of the wedge-shaped block, Lexington Pointe exposes its parking garage in a manner completely inappropriate for a prominent intersection facing one of Louisville’s most noted parks. Part of the garage is exposed outright and a false facade attempts to conceal another portion. A building site like this one has no “back” and the structure must present a finished and complete facade on all sides. Exposed parking garages won’t cut it. This section must be redesigned to better respond to its context. Renderings of the project, however, are still described as preliminary and subject to change. Don’t expect construction crews on the site any time soon. Lexington Pointe has a long way to go, including meetings before the Planning Commission and ultimately approval of Metro Council. I would generally like to see the project approved, and I’m optimistic that JDG will take it upon themselves to address a couple small design details. Or that the Planning Commission will require it. This development has the real potential to be a gateway to not just the Highlands, but to Downtown and the rest of the city beyond. There will also be plenty of NIMBY opposition along the way that could threaten to derail or substantially alter the project for the worse. 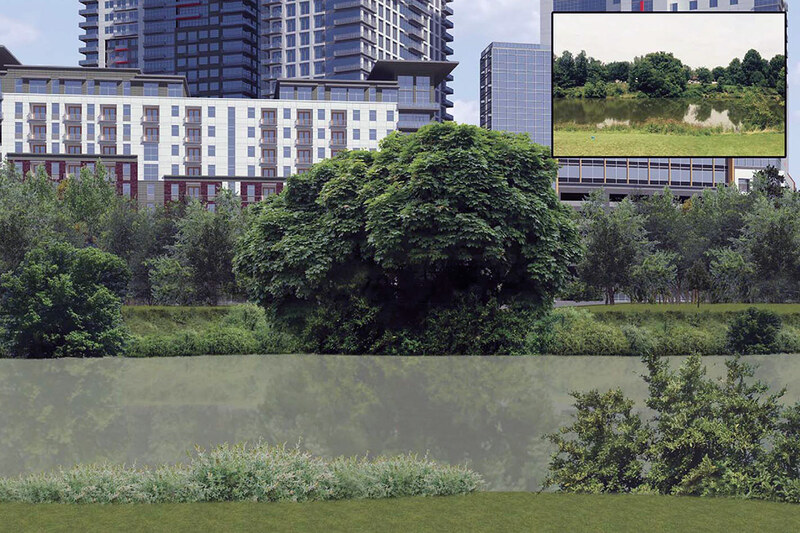 The arguments so far against the development include the towers’ impact on Cherokee Park, potential increases in traffic, sewer issues, noise problems, and perceived lowered property values, among others. The height of the three towers has reportedly been the most common complaint. Some opponents indicated they might initiate lawsuits against the project. Some of these complaints are being studied by the developer, but others have no merit. Despite opposition from some, there has been support for the project as well, so there is by no means a consensus that it won’t fit on the site or at the isolated confluence of neighborhoods. I count myself among its supporters. While the Lexington Pointe project has garnered more vocal outcry, another JDG development in far eastern Jefferson County deserves a critical eye and to be called what it is: exurban sprawl. Located in the car-centric suburbs near the county line at Factory Lane and Old Henry Road, the 107-acre project is like the Lexington and Grinstead project had no spine and collapsed all over former farmland. According to the Courier-Journal, the project calls for 160,000-square-feet of commercial space, 112,000-square-foot health club, a car dealership, a 203-unit senior living home, about 30,000-square-feet of retail space, some 1,800 apartments, and a whopping 4,000 parking spaces. The project is estimated at $200 million. That’s a lot of density way out on the edge of town. This is the kind of density that creates traffic without the benefit of walkability or urban vitality. There’s no transit that reaches the project. Each use is segregates into its own little corner, far away from other uses and disconnected from neighboring developments. 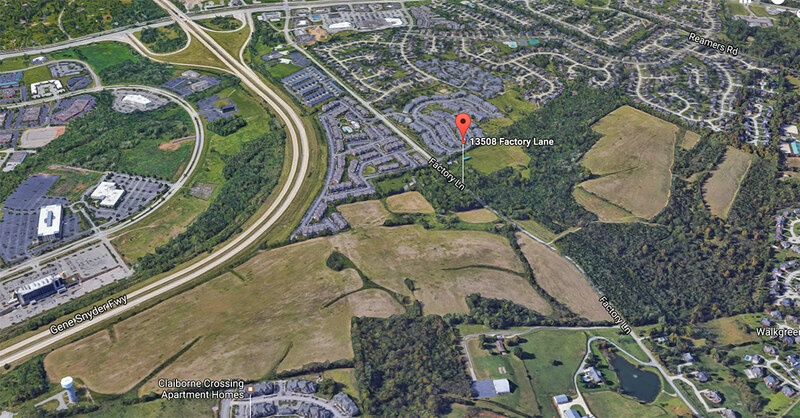 Massive parking lots cover former farmland and commercial buildings are spaced far apart. It’s exactly the opposite of what Louisville should be allowing to be built, yet it’s the norm for most projects in the county. Perhaps that’s why Planning & Design Services found the project conforms to Louisville’s comprehensive plan. And perhaps that’s why Planning Commission Vice Chair Marilyn Lewis called the development a “well thought out plan.” Rezoning for the site was cleared by the commission and passed by Metro Council in February. It’s clear that our comprehensive plan’s ideals of Neighborhood Form Districts and Suburban Workplace Form Districts are failing us and creating more and more auto-centric sprawl. 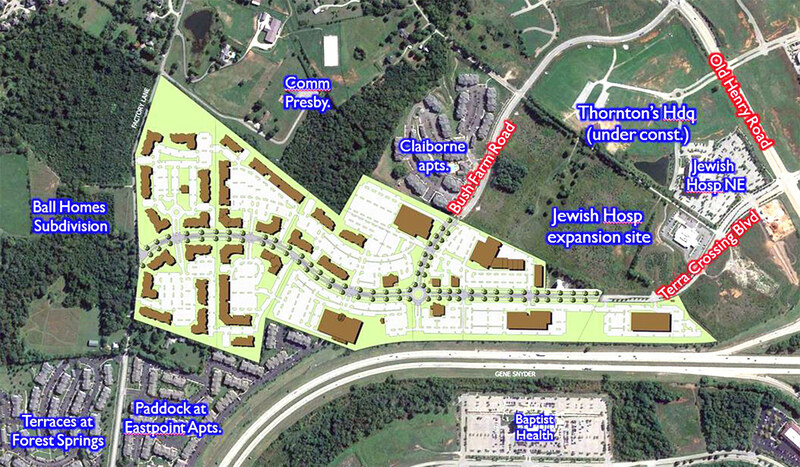 I hope that JDG’s Irish Hill project moves forward. I believe it would create an exciting mid-point node between several neighborhoods, provide a visual gateway to Louisville, and promote density in a way that can realistically reduce vehicle miles traveled (VMT). 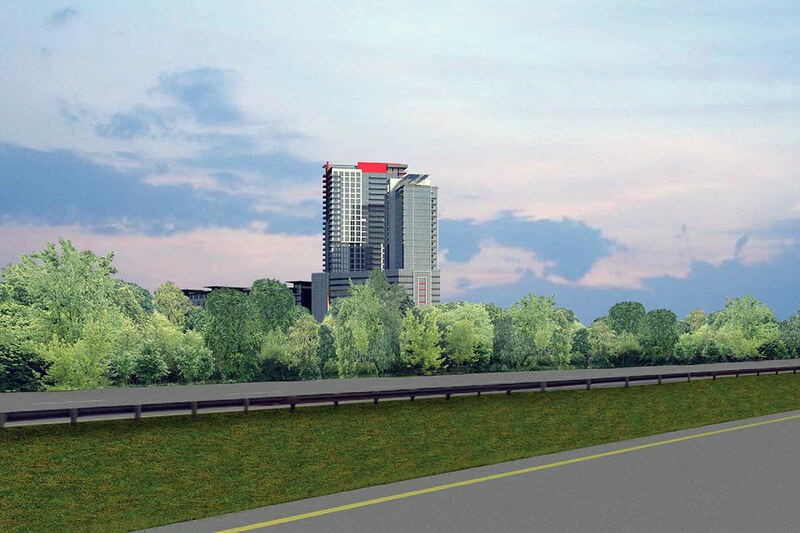 The proposal is on the right track and with the right attention to detail on the part of the developer and architect, Lexington Pointe could be a real showpiece. 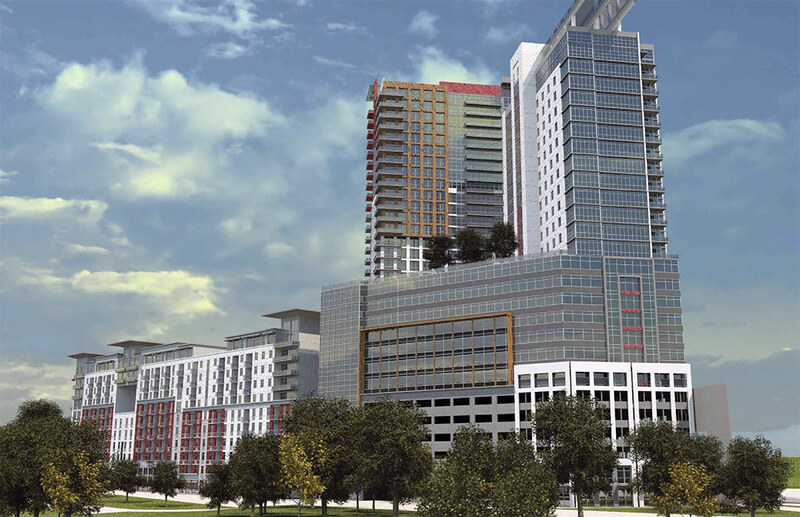 The developer has had some difficulty building in urban parts of Louisville, and it’s clear so far that JDG and its lawyer are attempting to avoid pitfalls that jeopardized or killed projects in the past. Jefferson Development Group previously proposed twin office towers atop a parking podium across from Slugger Field. The company demolished two historic buildings on the site but never realized the project. The site today is now a surface parking lot. After several rounds of revisions and staunch opposition from the Cherokee Triangle neighborhood, JDG abandoned a high-end condo development on Cherokee Road called the Cherokee Grande that would have replaced a 1970s apartment complex. 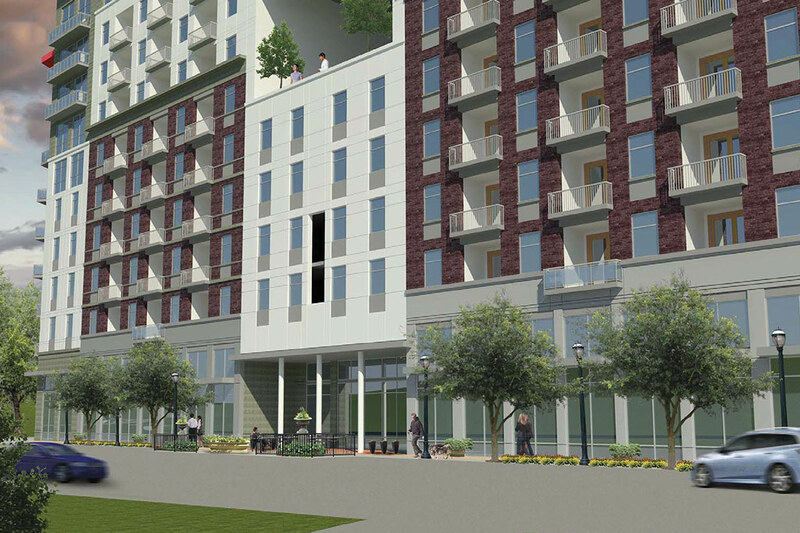 Another proposal, the Willow Grande condo tower, also in Cherokee Triangle, is still planned but has been held up by lawsuits. JDG successfully completed the unfortunately designed Parke Grande in Bonnycastle, a stack of McMansions on Cherokee Road, in 2006. My main fear is due to a lack of network of streets in and out from this wedge. There are only two arteries- Lexington and Grinstead. Just imagine one automobile becoming disabled(which may happen much more than we’d like to think with the new exits from the property.) I don’t mind the slight “towers in a field” vibe, because it’s not a completely false construct(suburban sprawl). I’d certainly like to see safe crossings into the park and over to Beargrass trail…a set of raised pedestrian bridges safely carrying cyclists and peds across these coursing arteries. A nice, sober assessment, Branden. I’m happy to add that the Lexington Ave bike lane is high on the B4L advocacy wish list. That might come more easily than the housing. How many more hotels does Louisville need? I loved your article. It was well written and explained. However, I feel to get local louisvillians interested in new developments you need bold statements and/or shorter blog posts. Too big, too tall. Let them build in on those vacant lots across from Slugger Field. The development team of Cogan & Bardenweper are accelerating the environmental damage from sprawl that our community will be forced to deal with for years to come. While we now face huge( billions & billions) MSD infrastructure repair & maintenance costs that were neglected for decades, we blindly allow it to be extended without weighing the cost on all citizens and their environment. The developers maintain that this is simply “infill” development, land for which this is its “highest” use. Rather it should be viewed as a corridor for vegetation and wildlife connectivity to the larger city. The developers should be required to present some pressing need, some over-riding benefit to be gained by the loss of this critical open space. This is not a job creator for people who need it—where they live. This is another instance of the larger community subsidizing commercial real estate development by extending infrastructure that we all pay for—all the while endangering our quality of life. Pollution of all kinds follows and spreads with this kind of development. Current residents suffer degradation of their life style. A transportation nightmare is unfolding as the Gene Synder is “built out” at Crestwood, Old Henry, Middletown and Bardstown Rd. exits over time—for which we have no solution. The Gene Synder will not be widened. All the binding elements in the world are not going to solve the traffic effects of dropping thousands of people in a two-lane neighborhood. We are building our way to gridlock and environmental degradation. Pushing for dense development like this in a relatively rural area while large swaths of Louisville go wanting for any kind of investment is a disgrace for our city. This community needs to develop tools / regulations (the hopes for Cornerstone 2040) that can consider long term effects of service expansion—and not have them regarded as simply impediment to profits. This is a great proposal and would really help the city. It’s at a very convenient intersection, it’s very centrally located, it has great amenities nearby. I live close by and 100% in favor, it will be good for the city and good for the neighborhood. I need an explanation of how all 2300 cars that will be parking in that garage will maneuver through the intersection of Lexington Rd & Grinstead Drive.